June | 2013 | Lynne O'Connor's Blog - Advanced Career Coaching Inc. If you were to ask me what the sets the successful job seeker apart, I would have to say the magic comes down to a single word – resilience. It’s the one outstanding quality that I’ve seen that seems to make the most consistent difference in building positive outcomes. While we will all encounter obstacles over the course of our careers, it’s resilience that enables us to spring back into action and make more informed choices. 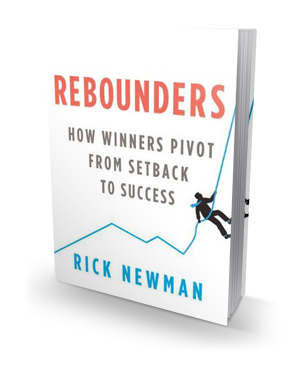 Here’s a fascinating new read that delivers some solid information on what’s at the heart of resilience, and one of the best books I’ve read in a while: Rebounders – How Winners Pivot from Setback to Success, by Rick Newman. If you’re inspired by true stories you’ll encounter many – Thomas Edison (the quintessential “fail faster to succeed sooner” inventor), Steve Jobs (‘nuff said), J.K. Rowling (from writing in coffee shops to writing for a global audience), Thomas Keller (Michelin 3-star chef, The French Laundry),and John Ratzenberger (Cliff from Cheers), among many. It’s not how wildly they succeeded that surprises, it’s how consistently each one wrestled with what wasn’t working until by increments they got it right. More than the story, it’s the thoughts and deliberations each went through in order to find a way to continue the search for what mattered, that are profound. Magnificent reading for career changers and job seekers. Setbacks can be a secret weapon: they often teach vital things you’ll never learn in school, on the job, or from others. There are smart ways to fail: Once familiar with them, you’ll be more comfortable taking risks and less discouraged if they don’t pan out. “Defensive pessimism” trumps optimism: Planning for what could go wrong it often the best way to ensure that it doesn’t. Know when to quit: Walking away at the right time can free the resources you need to exploit better opportunities. P.S. – While I read this as an e-book, I liked it so much I’m actually thinking of owning the hard copy – just to be inspired by real-life resilience in action again!